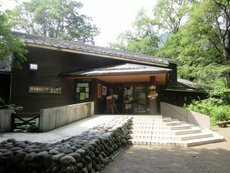 The facility located at Yumoto Onsen is the travelers' hub of the Oku Nikko area where we provide the information necessary for experiencing nature, such as plants, wild animals, and the hiking courses in the area. We also sponsor seasonal events such as nature observation sessions. April to November: Open every day from 9 a.m. to 4:30 p.m.
December and January: Closed on weekdays. Open from 9:30 a.m. to 4:30 p.m.
February and March: Closed on Wednesdays. Open from 9:30 a.m. to 4:30 p.m. Copyright © Nikko-Yumoto Visitor Center. All rights reserved.